With this latest in the The Worst Case Scenario Handbook series, readers can indulge their morbid fantasies and action hero daydreams while maybe even picking up a helpful tip for the next time they get stuck in quicksand, ride an out-of-control camel or suffer frostbite. 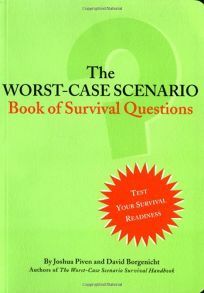 Piven and Borgenicht turn survival into a fun guessing game: with over 200 illustrated dilemmas in multiple choice quiz format, each with a level of difficulty rating, readers can test themselves (or their friends) to see how they might fare if caught in harm's way. From the outback (facing down a mob of kangaroos) to the urban jungle (falling through a Manhattan subway grate), the authors sketch out an array of dilemmas and solutions. Some of the situations cleverly combine titillating action with useful advice: if diving out a window into a dumpster is ever your only escape route from an intruder, be sure to ""jump straight down, executing a three-quarter somersault to land on your back so as not to break bones."" Other scenarios (eating poison berries, suffering severe dehydration) are more mundane and perhaps more likely. But the humorously far-fetched dilemmas (battling a sword-wielding renaissance fair actor, swimming through piranha) make for compulsive reading. Scattered throughout are tidbits including ""Which Is Your Worst Case?"" sections, Hobson's choice-style dilemmas (blizzard or a sandstorm?) with helpful facts to aid your decision. Of course this entertaining volume is hardly a practical survival guide, but readers will be compelled to test their survival know-how-just in case.